There is a place. It is in my memory and it is, is it stillQ. Unknown, somewhere else, but confusion is not what what all this complex storyQ No, it's not quite he, I mean, I well, says he, I can't answer that. It is Boris who must answer that. This place was in the countryside of Devon, where there is a village ~ let me ask you to imagine it, let us entertain the imagination with story. A village, thatch and gardens, colour and cucumber boxes (sign of contentment, Alice in Wonderland} smoke rising from chimneys or pipes which old men puff as they walk down the road. Here are all sorts of life, cows and sheep, dogs and goats. When I say 'men' I am wrong. 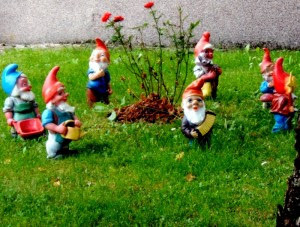 The village where Boris grew up is a place of gnomes. Boris and his people are broad, hairy gnomes who grow a foot or maybe a foot and a half tall. The rainbow horizon dots with spotted cows and jangly is the even moon. How do I know all thisQ Do not ask me, that is what Boris came for. He sits there telling his stories and I am googly tremblous. Dwarfed in my red armchair, he watches as I write, then he talks and I pace the room. 'Sit down and be calm or the story won't weave,' he tells me. I simply have to obey and sit opposite, waiting till he has filled his pipe. First, he tells old tales of his people, with characters tall in respect and prowess. 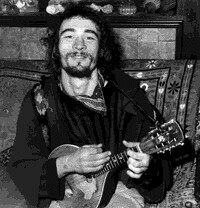 He speaks of harps and strange stringed instruments, of music made with sticks or hands. I can see rhythms like spider's fabric in the air. There are gentle voices in the music, winding through woods, green hills and misty tracks. Talks of the founding of churches, finding of springs and river sources. Talk turns to darker things and the room shades and patches, the dark crawls on to me and in to me, until Boris blows light and I am left blinking. He turns into a pumpkin and I laugh. He laughs and we both laugh so much that dawn comes and we decide to calm down and have tea, so that the sun doesn't join in as well and confuse the whole day. Boris looks at me. 'I will tell you a story,' he says . Though it has been stories all night, I know that this time it is something special. He looks at me dazzly craze and opens his mouth. 'There was Twilling ~ spread over Twill Valley. Here I was born and brought up. My parents had not always lived there but came down from higher ground at Starden, some cycles previously to be taylors two. I remember them as merry folk seeking true work, song, dance and nourishment alone. Simple people like you or I but starheaded and jewelled. Twilling was bright days and nights by the bridge. Moonlight lovers and I, sent signals of truth down the river. 'Twilling sent leather trade to villages on the river. It was all our own make, shoes and clothes for gnome and man. Raw materials we also sent ~ barges returning with payment days later. Our barge men were strong and capable folk, for on the road there were beasts and bandits. These lands of Devonshire are as full of peril as trees are full of wind. 'One night, the river spoke like an oozing black tongue. Rushing by, it spoke of something that had to pass and we waited, knowing it's truths. Tears are on Boris's cheek, and I admit that they are welling up in my eyes too. 'So all Twilling became scattered, many dead or enchanted by the speed of the serpent and riding on his back still. We had been picking canton buds from the hills and we returned to find desolation and the snake disappearing down stream. The serpent broke the river banks as he made his and I cursed his slithery soul. We wept to see the village broken and our folk killed or driven mad with frenzies of death. So it is that there are such things in the world. 'After time spent in emotions, we set to practicality. We would have to do something. Where were our parentsQ Many wandered dazed, no longer of Twilling and probably ghoulsome and unnatural now. I remember staring down the river and finding the remains of my father. How i wished to soar. I would be like an eagle but I felt like a tarred seagull. Oh carry me down stream, carry me down stream. I want to go, I want to know, I want to seek fortune and fame, I want to hold my hand in the flame. Such were my youthful thoughts. 'Coming to from my dreams, I realised we were all shivering with cold, so I lit a fire. Whose thoughts were theyQ I thought outloud and no one answered. 'Then down swept he and down swept one, down swept the all embracing one. He came on wings of steely metal ~ come with a force centripetal. He a machine and horror my head, so I kicked it and fell for dead. A head of dreams rose and there I was again, cold on the grass. The fire was low. It was far from dawn. I pulled on my great coat and wandered leaving my sleeping friends behind. Under the sinking moon I walked between silver valleys strange. I wandered down and round in a rhyme and so made up my silvered mind that I would slay that black beast rare. I would still him on the ground. That great worm would fall to my fury. I held above my head a sword, Blade by name. With this, the snake would die. So the weeks passed and I came to a wood where I had not been before. Now I moved from areas I know to places with no familiar landmarks. I followed the river for I saw, here and there, black scales fallen or a lock of hair, drenched clothes and scorched remains. These bodies were the worst, blackened and foul. Yes, one eye all remaining or a bucket of blood, laugh in a box, poltergeist meander people all sudden, only the eyes of a fox pop and gone. Such a foulness was in my mind that I could not be restful and had to walk. The river was blackened by the worm's passage and when I saw the stain leave the bank and make off through the wood, I knew that was the way the worm had gone. The trail spread wide and thich into the wood. With disgust and horror I looked on and plunged into the sticky wake. The forest was as dense as a colony of bats and all that could be heard was the constant speech of the leaves. The noise was mesmeric and I strode on over the ground. Suddenly I woke from my waking slumbers. A form was ahead of me in the undergrowth. I crouched. Looking on, I soon realised that it was not living, it was an idol of wood, in a squatting position. My thoughts were instantly of Men. They had built this. I went on wearing invisibility, following the black trail which was like an evil treacle, slimy sticky and sprayed everywhere. Then came the stones and great gaunt beasts which I silent and quick by, their sad rolling eyes and leathery bodies tall, slow in the trees as I slipped past. 'They made me melancholic. Here were many fabulous beasts, rare and pretty, dark and bulging, plumed, loathsome and many legged. In the trees, there were bird spirits, sensitive deva and fork tongued strangenesses. Sometimes the spirits of the trees would come and talk, bringing solace to my little fire. 'Yes, a long time I was in that place and many did I meet. Some brought good, some ill. Loose from the flames of hell for sure was Dragobeast, wingless dragon, green was he with red eyes. Stalked the undergrowth to come up sudden all teeth and tongue rolling, intent that I should be his next meal. I took my sword double quick and thrust it down his gullet. There sprouted a red flower, such a killing bloom. Old Drago~beast and I swapped roles, after I spitted him above the fire I made a meal of him. 'It was just then that Trollwitch came by. trust her to smell my lunch! Anyway, she and I spent long eating and talking, then we slept. Waking up again we tramped together me in step and in all wisdom known to her for she was wise. She told me to split reeds of bullrush for a head dress. If I wore it, I would be able to tell truth from lies. 'Later that day, I was walking when I found a piece of wood carved by the rain. How could this beQ No rain could reach the forest floor to carve it. I licked the piece of wood and it tasted of salt. How soQ It must have dropped from someone's pocket. I was puzzling over this, when I heard a voice that I knew and I cried 'Thomo!'. It was Thomo of Bracknell. He jumped from a tree and we embraced. 'There was a moments silence. 'How thick with friends these woods can be!' I said and we began talking. 'I did not scoff at him but looked into the fire brooding. 'The snake is old. It has the blood of many around it's foul mouth,' said Thomo. 'Fie will you, Boris of Twilling, stand a moth's chance of even bruising the beast' He spoke truth for sure. I'd been so absorbed in following Blackbane's trail that I had not thought what to do when I found him. 'Theekoo, my Blackbane, is to vast a foe for my sword. If you are offering your help that makes two moths against the sun.' We both laughed. 'Thomo spoke words which were on the wind. Oh memory! Twilling had been crushed, had spoken in my veins, then changed and crashed downstream. I could see myself reflected in the stream, I was looking down from a hill top, looking down, a dream on a hill. Boris stops his tale briefly and looks at me across the smoky room. 'Such a fellowship was this, Thomo and I, that we smelt the air anew, felt the land as mother to us both and we trod onward, beards waving in the wind, two hearts on a mission. We passed through valleys full of tall grasses rough to the skin, passes echoing caves and long rivers that yelped over rocks and foamed white over falls. Rapid travel we made ~ each our own heroes, with gleaming blades and a common foe. Thomo told me of past encounters with Theekoo, of the worm's magic and of the things it had done. He told me how once Theekoo took his bride. 'Over field, over county, through the air, borne by Pterodactyl to a castle on a high sill of rock.' Thomo answered. 'Night again, which came beyond the dusk where heroes slowed time as they flew by in the ruddy orange. We were around the burning flame talking and burning ourselves with what we heard. O thoughts of trouble ahead on the road! What significance did our journey have to anythingQ What indeed! The stars seemed to answer to augment our sorrow and lie deep troughs of sadness in our beings. Where is this quest goingQ What point is there in this storyQ I remember how we began to feel moody. Thomo would sit in an intensly grumpy state, never saying anything constructive at all. The dark night was all about and it filled us. All I could do was stare at the fire and pull my coat close. Soon, light made the trees speak sight out of the night and our spirits lifted. Morning peered over the hills and the flowers began to warm. We set to walking and walked for several hours. Then a sight came which dismayed us. It was the bllack belt we were following. I have said it had became thin. Now, worse still was to come. It dived underground! The snake had taken to ground, squirmed into the earth with Twilling on it's back. All memory to be revenged was down this hole. We didn't know what to do, so Thomo destroyed a patch of beautiful toadstools clinging to the base of a tree. We looked at one another and without a word, entered the dark hole. 'pouring ourselves into the wall of faces, he screeched his battle cry, joined by my 'Broomhilda! Broomhilda! Featherstar!' We caved and carved into beasts and the air was soon speckled with beans of blood. A fury of motion, our arms were like a thresher's flail, swords transforming creatures to unlife. Great wasting there was, and the gods of destruction were with us. Goblins with huge grey heads were easy meat for our swords which worked like fire to straw on them. Bodies were hacked and spliced, giblets flew through the air on fountains of red spray. Gore splattered everywhere but on we fought. I swear we slew two thousand goblins between us, along with additional greater things, winged ones and shadowy demons of deep places. We stood fifty feet deep in slain bodies, some still moving. All around was dismemberment and things disfigured, that gave off their own unlight. Here, a tentacle would wag in almost~death or a deep mourning belch would rise through the layers of the slain, spraying foul jellies and releasing horrendous gases. Carnage and loose meat would soon have become a mass playground for the maggots and we did not wait to join in their game. So, like a bubble fom the deep, we began to eat into the roof of the cavern, which we had reached atop the bodies. Clawing at the rock, we gnashed our way upwards to where air would be and we could stand again beneath the rays of our sun. Up and up we munched, throwing what we could not cram behind. Likewise, there rose a moan from the dead below, which followed us with dread~hate. We threw ourselves onward and upward. Like a red ball of fire it came, but we were faster and flew through the earth's surface into the sea of air. Down again we came, rapid as eagles to where we clung to the edge of the hole we had made and vomited down all we had eaten, plugging the streak of red fire that was coming up from below. We sat over the hole~that~was and took a meal of roast warthogs, caught from trees with catapaults. Then we took to talk and storytelling. FULK (Speaks slowly at first in an intoxicated or deranged manner in near darkness. Why do I still feel them about me? What could common people know? And if they knew, what could they do? But I took it all too far!! When; Not so! And more the fool I! How far indeed have I descended? They must have returned from over the oceans! Does it make me retch? YOU CANNOT BE EVERYWHERE AT ONCE! Ooh, that will be colourful! The weight of a billion deaths! In the fervor of your industries. Your pleasant land is dust! And you are quite something! ...and they squealed on you. Are you just a despot King gone Madcap? How many killings in the name? I don't believe in all that clap. "One life only" It says so on the bumper sticker. You want me to be frightened? You won't mind our little game then? Oh, we don't intend on hurting you at all. Do to the Great Fulk anyway? The Nydhogr works for us now . We got rid of the Ker. I thought you said you were going to torture me? 'im trippin' savage hangin' up for Mama Spinner! "What is always ahead but never seen"
But is this quiz for a child? Because who is to decide? Add two and fewer there will be"
Does it bring up anything for you Fulk? What is it about this mirror? Why do you keep on about this mirror? And what do you mean test? Who know it wants it not"
Hoop-La! Hoop-La! Hey Nonny Noh! Quick, cling to the rim of this big hole! Back again, where was I? Three makes a fast exit"
Where did he get these gags from?! The Three children of Drax the Giant? So are you going to look in the mirror - yet? Then you do see one. "don't see no"
Don't I strike awe into the heart! Don't you just want to be like me! Think the people love you do you? Each bringing something to the picnic? Yet a golden sun inside is hid"
Hole in your hollow crown? Took one a piece and left three in it"
Good job it's only a game eh! To use me well, use well your wits"
Hmm, some kind of dog? Are 'Wits' a kind of cigarette paper? She took me to the cleaners! She didn't love me at all! To that which one would expect? Oh, and here come more swords! Do you get a feel for the way this is all going? Would you care to look in the mirror? Great Monsters! Who is this fearsome being? Are they 'o's or zeros? He put the ring into his palm and said "Now I got none"
Big eye to little eye says "Why are you so small? If you were more small than small you'd not be there at all"
Big eye to little eye says "I hope this all ends soon"
Said Little eye to Big eye, "'Tis but early afternoon"
From such depths I never knew!! Who uses it does not know it"
What's the use in that? Why don't they know about it? Or what if they were dead? And three in the evening"
Thoth, why do I have to answer these riddles? Changing number all the time? And come night time what? And what come the night?